Paul started the Coalition on Homelessness after he witnessed the inability of local and federal governments to deal with ever-growing homelessness. He now is head of the Western Regional Advocacy Project, a group of California programs that works together toward creating housing for those without shelter and putting an end to mass poverty. His book gives organizing tips to others who would like to begin advocacy organizations or groups. We follow the pitfalls he has skirted throughout the years and see what concerns activists should be alert to as they plan to help others in an efficient and generally successful manner. Bob Prentice has written the introduction to House Keys. He was formerly director of the San Francisco Public Health Division and founded the Bay Area Health Inequities Initiative, a collaborative formed to transform public health practices and eliminate inequities, and to create healthy communities. The book contains artwork that embodies homeless and poor people’s struggles and other civil rights efforts during the 30-year period Boden addresses. 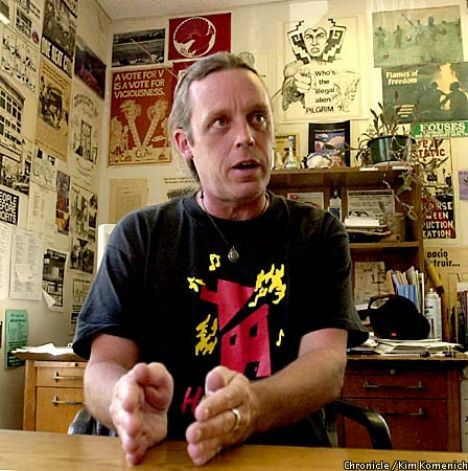 Artist Art Hazelwood, famous for his artwork in this genre, adds a detailed history of art that has been created to accompany justice movements and publications in San Francisco. Boden’s book is due out in October. He will speak at the Howard Zinn Bookfest (billed “a celebration of subversive books”) in San Francisco on Nov. 15 and at landmark City Lights Bookstore in San Francisco (co-founded by poet Lawrence Ferlinghetti) on Nov. 18.